Legacies (or bequests, as they are known outside the UK) represent a key source of revenue for charities – more than 50 per cent of income in some cases. This unique publication, in print for over a decade now, is a comprehensive guide to the strategy and techniques that fundraisers need. It also covers ethical issues, the law relating to will-making, legal pitfalls and how to manage legacy income. 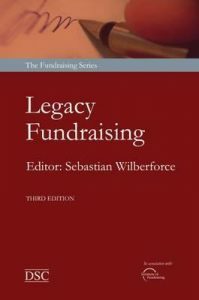 This third edition has been updated to take account of recent developments, for example, in the use of legacy events in place of or in addition to face-to-face fundraising, the role of the internet in legacy fundraising, the ‚Remember A Charity‘ campaign, how to choose an appropriate legacy administration system and advice on how to avoid disputers around legacies post death.